Two communities in the Birmingham region are in Phase I of the Alabama Communities of Excellence (ACE) program, which seeks to ensure economic development success among the state’s smaller communities. Center Point and Chelsea are both currently in ACE’s assessment phase, where experts visit the community to highlight its unique assets and recommend possible strategies for continued economic success. “We are trying to position smaller communities in the region to make them a viable part of recruitment initiatives when we recruit new businesses to the area,” said Nan Baldwin, vice president of regional development at the Birmingham Business Alliance. Baldwin is one of the experts on the Center Point team and serves as its co-chairwoman. Communities like Center Point and Chelsea, with populations ranging from 2,000 to 18,000, are ideal candidates for the ACE process and the long-term benefits. Last year, Autocar announced it will invest $120 million to create 746 new jobs for a vehicle assembly plant in Center Point. Baldwin said becoming an ACE community will maximize Autocar’s investment and better position the community to attract industry, such as Autocar’s suppliers. Similarly, Chelsea is a fast-growing city in Shelby County that is consistently ranked a top place to live and raise a family in the state. The first trucks rolling off the line at the new Autocar assembly plant in Center Point. 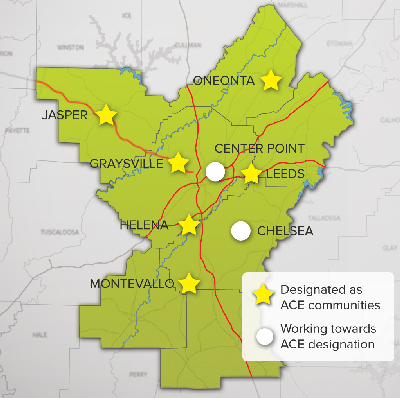 Since its inception in 2002, 35 cities in the state ranging in population from 2,000 to 18,000 have been designated as ACE communities, including six in the Birmingham region – Graysville, Helena, Jasper, Leeds, Montevallo and Oneonta. Center Point and Chelsea are two among nine in the state currently working towards the designation. After the assessment phase is complete, communities move into Phase II, where both a strategic plan and a leadership development program are developed for the city. In Phase III the strategic plan is implemented, and after successful completion of all three phases, communities are designated an Alabama Community of Excellence. No new communities are planned to be selected as participant communities in 2018, Baldwin said, but the competitive application process will reopen in 2019. Though each ACE community is unique, all share common ideals including better economic development, planning, leadership and quality of life. For more information about ACE, visit their website.